(2013 Treasure Hunt) (2013 Family Time Contest) After fishing with Windsong, Newt and Evervale reminisce. Spearfishing with Windsong had become an autumn tradition for Newt and Evervale. Newt remembered the biggest fish they had caught - two turns of the seasons ago. They had worked together all that afternoon, and finally found the perfect fish. It had taken all three of them to get it and bring it in. This evening's fishing adventure had been quieter. They had each speared several fish, some of which would be eaten later that night, and others which would be smoked or wrapped. But the air had been subdued. The past turn of the seasons had brought a lot of change - the Fierce Ones had returned and the tribe had been separated for what had seemed a long time. Though they had been reunited for more than a hand's moon cycles, there were still moments when any one of them might slip into silence. 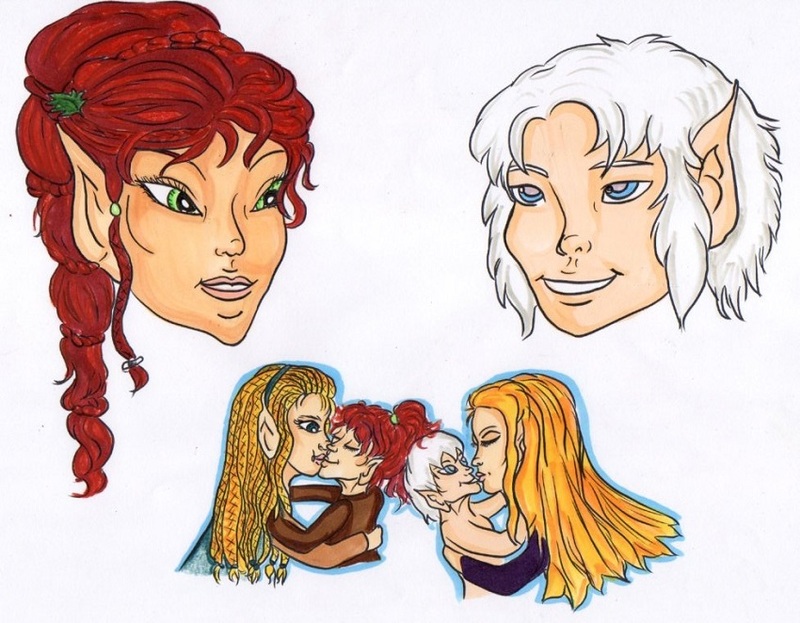 And such had happened this night, between he, Windsong, and Evervale. When the fishing had ended, they had carried their catch back to the Holt, and then Windsong had offered to take over seeing that it was stored properly. Evervale hadn't been quite ready for sleep, and neither had Newt, so the pair had taken a walk toward the Great Meadow, and had sat together in the moonlight, silently for a while. Then, Evervale had started talking. "It's always nice to hunt with Mother," she said quietly. He nodded. "I enjoy hunting with both of you. Spearfishing is a lot more fun with friends." She smiled at him, then rested her head on his shoulder. "Do you know what I miss, though?" He shook his head, not knowing where she was going. "I sometimes miss being a cub. When I was a cub, Mother seemed happier. She was full of hugs, kisses, and snuggles. Any time I needed them, and sometimes just because." Newt nodded his understanding at that. He missed his parents, and especially his mother's hugs. Lacewing had been so loving and kind toward him. He missed the warmth of her embrace. He had loved her hugs and the chance for a quick snuggle. Newt recalled the scents of the seasons on his mother: flowers in springtime, the grass during the summer, autumn leaves, and crisp cold snow during winter. Her touch had always been gentle and soft. He closed his eyes, remembering. After a few moments, Evervale reached an arm around him, hugging him from the side. "You miss Lacewing's hugs, don't you?" He nodded, not wanting to talk because of the tears that had come to his eyes. Even though it had been a long while since he was unwrapped, the pain of losing his parents could resurface from time to time. Tonight, though, it wasn't pain as much as it was longing. "When I Recognize, I'm going to make sure that my cubs get all the hugs, kisses, and snuggles I can give them. That way, they can have the same recollections that we have." He could feel her smile, and she said, "Me, too!" Illustration by Annika K., Kyna H. & Lyn C..